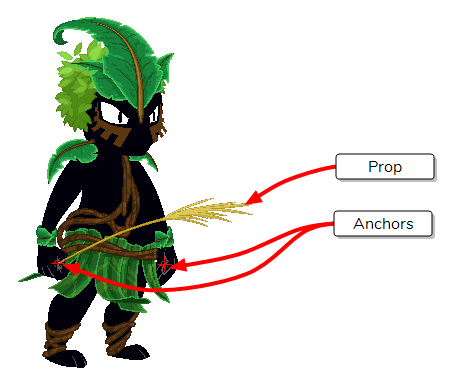 Anchors and props are a feature of Unity allowing you to attach a prop, such as an item or a weapon, to a body part in your character rig. This is done by creating an anchor on your rig, which is a point that can be moved and rotated, and to which the prop can be bound. For example, you could make the hand of your character an anchor, and the weapon the character wields with that hand a prop. A prop can be enabled and disabled in Unity. Also, a single prop can have several different drawings in it, which can be switched in Unity at any time. Hence, creating props for your character allows them to carry or wear different objects and equipment without rendering a sprite sheet of your character for each object. NOTETo be able to export your character with anchors and props, you must export your character as a rigged sprite sheet—see Exporting Rigged Sprite Sheets or Rendered Sprite Sheets.